Ramayan and Mahabharat are two great epics of ancient India and represent the highest ideals, culture and tradition of the Hindus. The Mahabharat is regarded as both 'itihas' (history) and 'kavya'(poem). In terms of knowledge, both spiritual and scientific, it is considered equal to the Vedas and often called the fifth Veda. The Veda (Knowledge), consisting of four books, is the most revered literature of the Hindus. The Mahabharat was never meant for the exclusive use of scholars, to remain on dusty book-shelves, but for every-one, and, as the Mahabharat points out, 'especially for women and Sudras who could not study the Vedas.' Through the Mahabharat the Vedas were to them. Spiritual and scientific education is the need of one and all to enable us to make the best of our lives. A message, when presented in the form of drama or story, is better understood and imbibed than when delivered through prosaic lectures and writings. The Mahabharat educates though stories and illustration that pertain to the problems that we encounter in life. It is this that has made it a perennial source of inspiration. Puran means 'that which breathes ancient times.' There are eighteen main Purans. They normally consisted of five topics and are also regarded as itihas. They are for popular edification and contain the whole body of Hindu mythology. They are held to be sacred. The episodic matter in the Mahabharat is largely Puranic in character. The Purans that come closet to it are the Skanda, Padma and Bramha Purans. Kings and queens too are exhorted to read the Mahabharat, for those who imbibe its teachings prosper, says the Mahabharat. The Mahabharat shows the importance of dharma in all activities. Creation is based on sacrifice. We consume (sacrifice) food, thereby creating energy necessary to life. When we transform physical energy we transform one form of energy for another. We are shown that the really strong and trustworthy are not those who cling to material things and worldly attachments but those who perform their respective duties and professions selflessly, without fear, favour, attachment, partiality or self-interest, with honesty, knowledge and efficiency, unmoved by victory or defeat. This balanced attitude of mind is called yoga. This is integrity. Integrity belongs to the selfless and not the selfish. The weak materialistic man blames destiny for his misfortunes but in fact creates his own destiny by his own deeds. Moral human striving therefore assumes the greatest importance in all fields of worldly existence. Krishna Dvaipayana in the recognized author of the Mahabharat. He is also known as Vyas, the Expander, for dividing what was one Veda into four. Vyas declares in the Mahabharat, "I raise my hands and call out, but none listens to me. Artha and kama are both realised through dharma, so why should we not conduct ourselves according to dharma?" What he stresses is that man's material well-being can only be ensured through moral well-being. Dharma is the very foundation of the Mahabharat. It is a Dharmagranth (book). The putative hero Yudhishtir is called Dharmaraj, and he himself is the son of Dharma. The war is a Dharmayuddha. The battle field is Dharmakahetra. God Narayan incarnates as Krishna to restore Dharma. And "victory is where Dharma is ." Bhagwan Sri Krishna, who represents the very Soul in the Mahabharat, declares he has come on earth to protect the good, destroy the wicked and establish dharma on earth. He has come in fact, heeding the pleas of the harassed Earth who is suffering under demoniac rules and oppressors. The Mahabharat was first known as Jai (victory), to inspire those who wanted to be victories over their enemies. It later came to be known as Bharat, a trilogy of twenty-seven thousand stanzas describing dissensions between princely cousins of the race of Bharatas, loss of kingdom and ultimate victory. As more and mare myths, legends and didactic material kept on being added to it, it came in time to be known as the Mahabharat-the great Bharat. The Mahabharat consists of eighteen Parvas or books totaling a hundred thousand couplets in Sanskrit, the venerable language of the Vedic Aryans. It was the language of literature for nearly three millennia, continually adjusting itself to the changes of times. As the Mahabharat stands midway between the Vedic and classical epoch it naturally partakes of the linguistic characteristics of both. In our cultural heritage, a substantial part comes from ancient Bharatvarsa and Sanskrit literature, and in the centre of this vast pile stands the dateless and deathless epic the Mahabharat. Throughout Indian antiquity it has evoked the widest interest and forms the strongest link between the old and the new. Its charm lies not only in the characters and situations presented, brut the condensation of though and vividness of expression achieved by picturesque use of similes and metaphors. It has always, throughout the ages, occupied an eminent position, enjoying the highest reputation. It was used as a book of education in Bana's time. It has inspired poets and dramatists. It has attracted great philosophers like Samkara, Kumarilla, saints like Jnaneshwar and Ramdas, rules like Akbar and Shivaji. It traveled to the far east to Burma, Saim, Java and Bali. The immortal stories of this epic are carved on the walls of their temples and acted in their 'waygongs'. It can be no ordinary book that, even often two thousand years, is still fresh in the minds of the people who do not seem to tire of it. There has to be something in the book that evokes this sustained interest. Sukhtankar, the editor of the Critical education of the Mahabharat, observes that the perennial freshness of this great epic is due to fact that it deals with human nature to show how this nature can be used for good or for ill. The anchorite or anchorites were imbued with the idea of untangling the knot of personality for the sublimation of nature it possible to realise this ideal. "Unseen but all-pervasive in the life of every people is the great company of its ideals. The Mahabharat is the Golden Treasury of the ideals of Indians at their best. "This book offers to each what he needs and what he can digest. One of the serious flaws in western criticism of this book, as Sukhtankar points out, is their obsession with the 'core epic'. It is impossible to verify this supposed 'core' because, on going back to its source, it is seen to have not one source but many. Similarly, theories have been evolved by them without any corroboration. It probably has caused uneasiness to some critics that the moral is nearly four times as long as the story itself Yet, can we lose sight of the fact that the very purpose of the epic is the moral? This look, eight times the size of the Iliad and Odyssey together and three and a half times the size of the entire Bible, like all popular plays and epics, has always been a fluid text adjusting to the varying needs of the occasion and the audience. It is mentioned by Kautilya and Panini. It was known even in Buddha's time. It was first most probably recited, and then later, around the second century AD, taken and elaborated on by the Bhrugus who ever very closely associated with the Dharmasastras. Not only is it a book of inspiration and guidance in life, but it is endowed with a deep religious feeling permeated with a conscious didactic purpose, a work in which a moral was conveyed by a parable, an elusive truth by a tangible facile myth. "And to the creators of an inspired book of this type we must at least allow poetic license and common imagination." That those who contributed to this vast work were anchorites concerned with man's well-being and the well-being of the world, there can be little doubt. There is a deep and sympathetic understanding of nature, both in its macro and micro aspects, a breadth of vision and sharp discrimination  qualities associated with all true seekers of Truth and not normally associated with the mere scholar and pedant. There are in all, three raconteurs of the Mahabharat. The acknowledged author is Krishna Dvaipayana Vyas, who was witness to the events. The story opens with a suta or minstrel arriving at a twelve year yajna being performed by Shaunak and his priests what happened at snake yajna being performed by King Janamejaya. Janamejaya asks Vyas who was present, "How arose the occurred the great war which was the cause of the destruction of so many beings?" Vyas then asks his pupil Vaishampayan to recite the whole story. The story is on three planes. On the mundane plane it is a late of a great war that took place between two royal families of cousins, their friends and allies. Brave intrepid warriors, beautiful courageous and virtuous women, unworldly saints and enlightened sages enliven the pages of this great work, holding the reader in thrall. Along with this are inexhaustible details of Indian social, political and religious life, minute descriptions of weapons of war, etc. the story winds its leisurely way with steady aim through masses of elaborate treatises on law, philosophy religion custom, geography, cosmology, together with a formidable array of episode and legend. There is animation and colour from beginning to end. The Mahabharat provides a character study of the different personalities involved, and their reactions to various situations. The characters are well-drown and true to life. They are also consistent in their actions from beginning to end. Observes the Mahabharat, "Duryodhan is the great tree of ego and arrogance. Karna is its trunk, Shakuni its branch, Duhshasan its fruit and flower and Dhritarashtra, blinded by ignorance, its root. Yudhistir is the great tree of Dharma. Arjun is its trunk, Bhim is branch, Nakul and Sahdev its fruits and flower, god and Brahmins its root." King Dhritarashtra is blind both literally and figuratively. His blind attachment to his son Duryodhan 'his own flesh and blood', prevents him from discouraging his son in his unjust and criminal acts prompted by greed, envy and hatred against his Pandava cousins, their wife and mother. Though Dhritarashtra is himself not an active participant, his acquiescence makes him party to the acts. Despite all his learning and even knowing that he is wrong, he, like all weak people, blames destiny. The law of Karma however is a mighty law which makes man himself the architect of his own destiny. Krishna, after initiating Arjun into the mysteries of the Karma doctrine, tells Arjun, "Do as you wish." The grip of destiny is illusory because nothing can deprive man of free will and the freedom of choice. In Duryodhan we see determination combined with envy, hate, cruelly and unscrupulousness; in Karna pride, arrogance and malignity with a strange streak of generosity, in Shakuni and Duhshasan unmitigated wickedness. In Yudhishtir we see charity, peace and self-control, giving at times an appearance of weakness. Bhim, innocent, is proud of his immense strength and is reckless and impetuous. Arjun displays chivalry and prudent heroism. Vidur is Dharma personified. Accepting his lower station in life he gives his best, never shirking to give the right advice to his blind king even when knowing it to be unpalatable. The Vidur Niti is justifiably held in high regard. Bhishma's is the towering figure of the Ideal Man sacrificing his own happiness and doing his duty to the best of his ability without self-interest, in the true spirit of the Gita. These are but some of the many well-drawn characters in this epic. While of the mundane plane the story is about jealousy, intrigue and strife, it is lifted to the ethical plane by depicting it as the ever-recurring struggle between gods and demons. The Adi Parva relates how the gods and other denizens of the heavens, and the demons, came to earth and represent the many characters in the drama. The story is thus given a comic background. The forces of Dharma and Adharma represent the godly and the demoniac. About the identity of Krishna the Mahabharat leaves us in to doubt whatso-ever. He is Isvara. He is the Purusa of Sankhya, and the Brahma, Atma or Pramatma of the Vedantins. Dharma is established through behaviour. It is essentially a belief in the conservation of moral values. Bhishma explains to Yudhishtir, "Dharma was ordained for the advancement and growth of all creatures, therefore that which leads to advancement and growth is Dharma. Dharma was ordained for restricting creatures from injuring one another, therefore that which prevents injury is Dharma. Dharma is so called because it upholds all creatures, therefore that is Dharma which is capable of upholding all creatures." Since Dharma is both complex and manifold, it is necessary to know the many kinds of Dharmas or duties e.g. Rajdharma (duty of rulership), Prajadharma (duty of citizen), Daanadharma (ethics of charity), Apaddharma (conduct in times of distress), Stridharma (woman's duty), Moksa dharma (conduct for liberation from cycle of birth and death). Etc. these help as guidance in dealing with various situations in life. Dharma, Artha, Kama, and Moksa are the four legitimate aims of man. Of these the last, supreme and beatific, is attained by a very few. Among the others Dharma must come first, then Artha and the last Kama. Dharma, we are told is the source of both Artha and Kama, although the man of middling discipline preface Artha to the other two. The fights between the Gods and demons in the Vedas get translated in the Mahabharat into a struggle between righteousness and unrighteousness, good and evil, justice and injustice, knowledge and ignorance, etc. The poem however rises to even greater heights, surmounting all dualities to merge into the ultimate Reality. Sri Krishna is the paradoxical Unity in diversity  the source and Goal of all existence, and his message, the Bhagawat Gita, given in the Bhishma Parva, the first of the battle books, is the very kernel of the Mahabharat. The Bhagawat Gita, Upanishads and the Vedanta or Brahma Sutra are the three recognized authorities on the Vedanta philosophy. In their search for Truth the Upanishadic seers synthesized the plurality of Vedic gods into the One Ultimate Reality. This Reality moreover was also brought within reach  within the secret recess of one's own heart. Henceforth the old gods (devas) and lokas (worlds) merely become symbolic entities and levels of reference, states of being realisable within oneself. It is this philosophy of the self that gives self-reliance, self-respect, self-restraint and self-confidence, so essential to life. Sri Krishna and Arjun are described as God and man. It is not a mere coincidence however that one of Arjun's names is also Krishna! Arjun is advised by Sri Krishna to be a yogi. The true Yogi understands the unity and integrity of the universe through reason and the spirit of renunciation. All his karmas or activities are free of self-interest, balanced and impartial, for the highest good, and he serves the self with devotion and dedication. The true Yogi is thus intellectually, activity and emotionally in tune with the self. The word Yogi therefore should not be confused with mere practice of yogic asanas. The true Yogi accepts his place in life of and performs his duty to the best of his ability without envying another. The Mahabharat takes us to the greatest heights by rising from the mundane to the ethical and then to the metaphysical plane. In this lies its eternal value. It should be obvious that the Mahabharat is a very important part of our heritage. 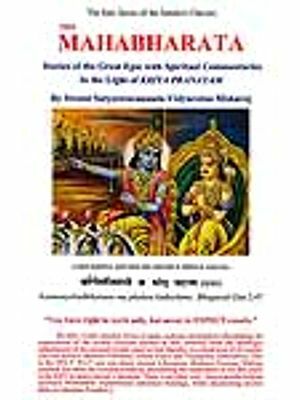 While the Bhagwat Gita and the main theme of the story are well known, what is not so well know are the many gums of thought embedded in this great work in the form of stories, parables, discussions etc., which deserve to be known and understood because they were meant for our knowledge and understanding by the writer or writers of the Mahabharat. The "Tales and teaching of the Mahabharat" is meant primarily to make the reader acquainted with these gems of thought. Some stories are well known. Not so well known is context in which they are given. Wherever necessary the background has been given so that the connotation is understood. There are many other stories which are not as well known as Nal and Damayanti or Savitri and Satyavan, both of which have passed into world literature. But these too have something important to say. "Bhrugu explains the world process to Bharadwaj" for example, is a complete tract on Hindu ontology, sociology, eschatology and ethics. Because the Mahabharat is so vast, obviously a selection had to be made to restrict the size of this book! The attempt throughout has been to be faithful to the text. The only departures made were when a literal translation would have distorted the meaning or made the sentence in English too cumbersome or convoluted. At such times a simple direct translation has been preferred. Similarly, repetitions or long lists of names, places, flora and fauna etc. have been deleted. To use archaic language merely because a book is ancient would be a disservice to this work, which was meant to help men understand and deal with the problems of living, and this applies to the present day as well. The narrations given are not according to any groupings but given according to the sequence in which they appear in the Parvas. The book used for this translation is the Mahabharat translated into Hindi by Dr. Sripad Damodar Satvalekar, which reproduces the Sanskrit text in the original Sanskrit from the "Critical Edition of Mahabharat" of the Bhandarkar Institute, Pune, edited by Dr. S.V. Sukhtankar. The Critical Edition was undertaken so that it would be an authoritative reference for all serious students of the Mahabharat. Dr. Sukhtankar, its first editor, laid down the procedure to be followed, and this was continued even after his death by successive editors, all dedicated and capable, For this work all existing recessions were collected from all parts of India, Nepal and other countries of south-east Asia up to Java and Bali. It meant sifting through all these, putting together what was common to all and nothing the divergent readings in the critical notes. The attempt was to make the Critical Edition a 'veritable Thesaurus of the Mahabharat tradition.' Those interested in knowing more about it and the methodology followed should read "Critical studies of the Mahabharat" Vol. I and II, of the Sukhtankar Memorial Edition. The Critical Edition took about forty-two years to complete. It would appear from the Critical Edition that the Mahabharat was more or less the same in all recessions till around the tenth century AD. Portion relating to Dharma, about a third of the epic, is the same in all and hence, very ancient. There are certain misconceptions about some of the characters in the Mahabharat which do not confirm to the Mahabharat and seem more a triumph of emotion than reason. Some of these are mentioned here. The story of Shakuntala and Dushyant is somewhat different to the one immortalized by great poet Kalidas in his Shakuntalam. And Kalidas must be allowed poetic license. Karna has been the object of much sympathy, and to some born out of wedlock and abandoned at birth for no fault of his. This unfortunately has led many a modern commentator to invest him with a halo wholly unmerited, some even going to the extent of ignoring his misdeeds and questioning the text. They have failed to appreciate the character study of Karna made in the Epic, which has drawn a psychologically correct picture. Karna has this 'chip on his shoulder' about his birth, and subconsciously regards the Pandavas with Draupadi, as society, on whom he wishes to take revenge. He is never content with what he has. Actually he was not denied parental love even if they were his foster parents. He become king when young. He had the protection of the kavach and kundal that he was born with. He however was never satisfied and always wanted something better. Despite his ability and capability he was unstable. And he look the lead many times in the mean acts against the Pandavas. His acts of giving up his kavach and kundal which is much eulogised was actually a barter because he asked in exchange India's weapon. He also requested that he should not be disfigured, and Indra on his own promised he would also suffer no wound. His liberality had the spirit of competitiveness as he wanted to show he was better than other kings. It was this weakness, this self-image, that Indra took advantage of. Unfortunately, those who extol him ignore his moment of truth which deserves recognition, as when he tells Krishna that Yudhishtir is more fitted than Duryodhan to be king, and also asks Krishna not to disclose his real identity to Yudhishtir as then Yudhishtir would offer him, Karna, his elder brother, the throne. Another character made much of in recent times as an object of pity is Ekalavya, a minor character in the Mahabharat. Guru Dronacharya is blamed of rejecting him as a pupil because he was of 'low caste'. The Mahabharat account is different. Throughout the Mahabharat it will be seen that a word once given must be kept. In these days of promises made easily and broken as easily this may not be understood but it has to do with integrity. To break one's word was to be untrue to oneself. When Ekalavya, the son of a Nishad chieftain, comes to Dron, Dron him as a professional being a Nishad, who were professional hunters. Dron feels that Ekalavya would excel the princes who were in his charge, and this he is not prepared to accept, as he is in the employ of the Kurus, and he sees his first and foremost duty to be towards his charges. He therefore refused to accept Ekalavya as his pupil. Ekalavya does not let the refusal deter him and proceeds to practice in the forest in front of a mud image on Dron. His story shows what can be achieved with single-minded devotion and striving. Far from being an object of pity, Ekalavya should be a source of inspiration. The proficiency that he achieved by himself ultimately brought Dron himself to him and the gurudakshina Dron requested was the recognition he desired from Dron. The victory was actually Ekalavya's. the thumb that Dron asked from Ekalavya as his gurudakshina was to make good his promise made earlier to Arjun when, pleased with Arjun's dedication, he had told him he would make him the best archer in the world. The loss of his thumb which he gladly gave to Dron, did not prevent Ekalavya from using the bow and arrow, it only made his speed slower. Much later, in the great Mahabharat war, Dron and Ekalavya were to fight on the same side. The Nishads were a respectable community and were close to the Aryan community. The character of Draupadi, as that of many women mentioned in the Mahabharat, gives a lie to the assiduously propagated attempt by some, to depict Hindu women as dumb followers. Draupadi's appeal to the elders of the court when the most unspeakable indignities were being heaped on her, can only elicit our administration for the race, dignity and intelligence with which she forcefully pleased her case. She is the epitome of womanly grace, purity and loyalty. Is it any wonder then, that even Karna had to exclaim, "Of all the beautiful women in the world, I have never heard of one such as Draupadi. She is the boat which has taken her drowning husbands safely across the waters." For reasons of space Draupadi's plea in the assembly where she was dragged, has not been given in this book. It occurs in the Sabha Parva of the of the Mahabharat. There are many characters in the Mahabharat that deserve mention but cannot be dealt with here. Interested would find Dr. S.V. Sukhtankar's "On the meaning of the Mahabharat" helpful. He also, in this book, deals with western criticisms at some length. The above have been mentioned here merely because a lot of misunderstanding prevails about some of these characters, and these need to be set right if we wish to understand the Mahabharat. Many Sanskrit words have been retained in this book because there is no corresponding word in English that gives the same meaning. The meanings of these words have been given in the Glossary. These words have also been reproduced in the Devnagari script in the Glossary to give the reader an understanding of the correct pronunciation, which the Devnagari script is more fitted to do than the Roman. Using diacritical marks of Roman letters would unnecessarily increase the price of printing  and this book! The usual practice of putting an 'a' after a name has been done away with however possible, as it leads to mispronunciations like, for example, the 'ma' of Rama being pronounced like the 'ta' of Sita! The practice of putting 'a' at the end of a Sanskrit word is because in Sanskrit, the last letter (unless characterised otherwise) is pronounced with a vowel sound at the end, more like 'u' in 'us'. It was also though that some quotations from the Mahabharat would be of interest to the reader. These are illustrative of the approach of the Mahabharat. These are given at the end. The Mahabharat is concerned with goodness, but it also points out that goodness is not foolishness. The wicked and the foolish invite their own destruction. Vice and virtue are not the monopoly of any individual or community. The quality of an act but also its appropriateness according to time and place. Observes Sukhtankar, "there is a danger that in our present pseudo-scientific mood we may be tempted to discard this great book, thinking that we have outgrown it. That would be a capital blunder. That would in fact mean nothing but an indication of our will to commit national suicide, the signal of our national extinction." No more. Let the Mahabharat speak for itself.